Used Ford Fiesta ST Review - 2018-present | What Car? Sometimes it is true that the best things come in small packages. Consider the Ford Fiesta, one of Europe’s perennial best-sellers and a car in its standard form so accomplished as to consistently win top honours in the small car category. If that weren’t enough since 2004 Ford has produced a sporting version called the ST. In its first generation, this car was a hoot, while in its second it was quite sensational, and a clear class-leader. Now, though, we have the third-generation car, actually, the fast version of what is in fact the Mk 8 Fiesta, launched in 2018. Confused? Don’t be. This Fiesta ST is still the bees-knees, but it goes at things a little differently to the previous generation. Whereas the older car had a 1.6-litre turbocharged four-cylinder petrol engine under its bonnet, the new car has an all-new 1.5-litre three-cylinder turbo one, incorporating new technology that allows it to run on just two cylinders in conditions where full power is not the top priority. 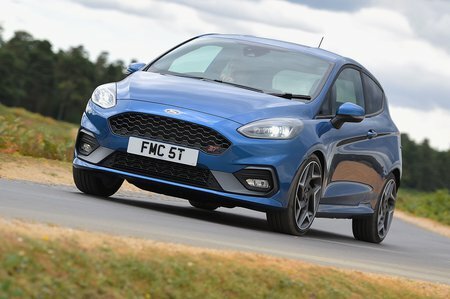 This car, echoing the standard Fiestas, is slightly longer and wider, too, and the ST now sports quicker steering and the option of a limited-slip differential, for better handling. Trim-wise, the ST is available in three different versions: ST-1, ST-2 and ST-3. Standard equipment isn’t stingy, with 17in alloy wheels, air-con, electrically operated and heated door mirrors, keyless start and cruise control all included with the entry-level trim. Step up to ST-2 and you get an upgraded sound system, plus climate control and rear privacy glass, and the ST-3 adds 18in alloy wheels, automatic headlights and wipers, power-folding door mirrors, heated front seats, a heated steering wheel and keyless entry. On the road this all adds up to one little humdinger of a car. That engine may only have three cylinders but it blasts through the mid-range with a surge of punchy and pleasurable performance. Indeed its acceleration times from a standstill are pretty impressive, too, with the 0 to 62mph dash completed in just 6.6 seconds. Its artificially enhanced engine noise also provides a sporty and muscular note to proceedings. The standard six-speed manual gearbox has a short, snappy change, and the ratios are well chosen to make the most of the car’s potential. There are three driving modes available: Normal, Sport and Track. Moving to Sport from Normal makes the accelerator more responsive, adds weight to the steering and makes the exhaust more vocal. Moving to Track switches off the car's traction control and relaxes its stability control for maximum driver control and, of course, enjoyment. In corners it’s fab. The steering is quick and direct and there’s plenty of grip. The handling is tremendously good fun and adjustable via the throttle, although cars with the limited-slip diff offer more traction in tighter or wetter bends. The payback for all this fun is a ride that is firm and occasionally too bouncy. On broken British B-roads it can all feel a little too busy, and on longer journeys quite tiring, but it is the price you pay for its undeniably good cornering abilities. Inside the driver has a figure-hugging and very supportive Recaro sports seat, and there’s plenty of adjustment in the steering wheel and seat itself, so people of varying heights and shapes should be able to find the right driving position. Visibility is good, as is the perceived interior quality. 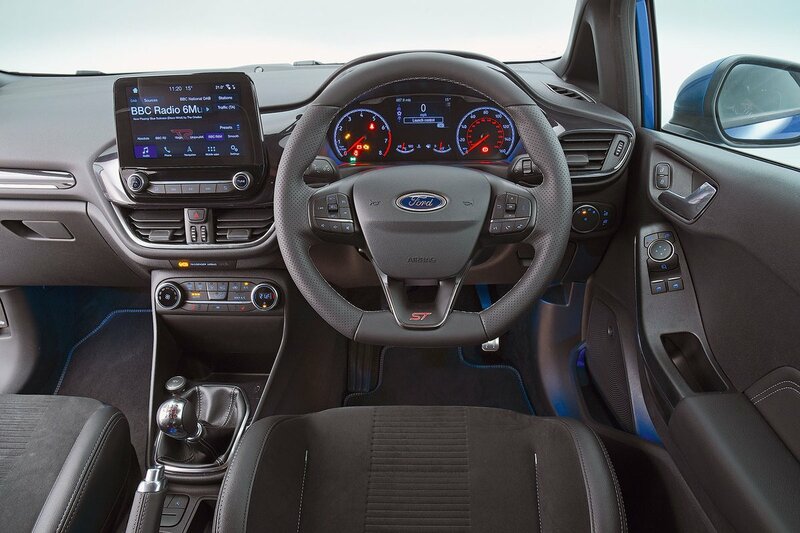 Ford's Sync 3 infotainment system is standard and comes with an 8.0in touchscreen. It offers sharp graphics, lots of features (including Apple CarPlay, Android Auto, a DAB radio and Bluetooth) and relatively simple menus. One gripe is that there are no physical shortcut buttons to make it easier to hop between functions, though. There’s plenty of space for the driver and passenger up front, but rear-seat passengers will find it more of a squeeze, especially if sat behind a tall person in the front. At least this latest ST is available as both a three-door and a five-door car, though. The Fiesta’s boot trumps some of its rivals for outright volume, although dropping the 60/40 split rear seats does leave a slightly stepped floor.